Donations for Mark Collin | Effingham Cricket Club. A much-loved friend, teammate and club member who passed away on the 19th of August 2017. 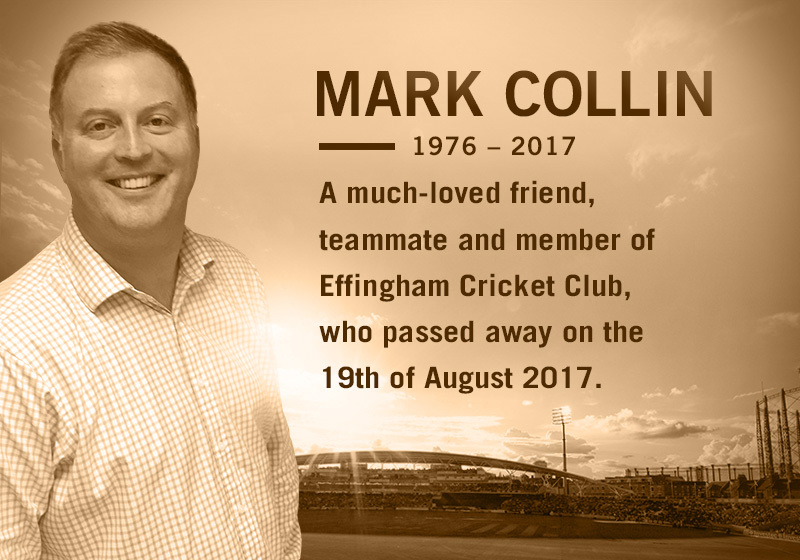 On behalf of Effingham CC, family and friends of Mark Collin, the Club would like to express our utmost gratitude to everyone who has been in touch to offer their condolences. Your tributes have been an inspirational source of strength for all of us as we come to terms with the heartbreaking loss of such a widely respected and much-loved son, husband, father, brother, friend and teammate. We cannot appropriately express our gratitude to those who have offered to make a donation in memory of Mark. These offers are incredibly moving and most sincerely appreciated. Having consulted with the family we have decided to open a page on JustGiving for anyone who wishes to make donation. Any funds donated will be used for the benefit of Mark’s family and to his commemoration. Please click here to visit the JustGiving page. In a wonderful gesture, a number of clubs have kindly offered to donate their match fees from this weekend. If your club would like to participate in this then please do so via the justgiving page.